Following a renewed attack on Nigerian nationals in South Africa popular US trained journalist, Kemi Olunloyo, has called on Nigerians to take a stand. Ms. Olunloyo fumed at the persistent xenophobic attacks on Nigerians in the country where their businesses were burnt and their goods looted. The daughter of Victor Omololu Olunloyo, a former governor of Oyo State, said the ‘first’ way to fight back was for Nigerians to boycott all South African businesses in Nigeria. 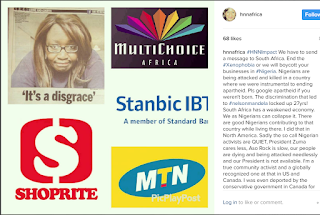 The outspoken activist made this known on her Instagram account @hnnafrica. She wrote: “#HNNImpact – We have to send a message to South Africa. End the #Xenophobia or we will boycott your businesses in #Nigeria. “Nigerians are being attacked and killed in a country where we were instrumental to ending apartheid. Pls google apartheid if you weren’t born. “The discrimination that led to #nelsonmandela locked up 27yrs! South Africa has a weakened economy. We as Nigerians can collapse it. “There are good Nigerians contributing to that country while living there. I did that in North America. “Sadly the so call Nigerian activists are QUIET, President Zuma cares less, Aso Rock is slow, our people are dying and being attacked needlessly and our President is not available. “I’m a true community activist and a globally recognized one at that in US and Canada. I was even deported by the conservative government in Canada for doing the right thing. “These are not North American people I’m protecting now. These are Nigerians! MY PEOPLE. “I have never been to South Africa. I may never. I urge every Nigerian to boycott all #SouthAfrican business begining 2/23/17. “Do not renew your DSTV/GoTV. “Close your account at Stanbic IBTC. “Do not purchase food at Shoprite. “Do not recharge phone or data with MTN. “SAY NO TO #Xenophobia and anti-foreigner protests. “It is all HATE. Homophobia, Xenophobia, Islamophobia, Christianphobia, I’ve always been against all forms of discrimination channelling HATE!